Summer is the greatest time of the year here in California for diving. The water gets warmer, visibility starts to open up, and surface intervals are spent sunning yourself on the deck, bagging Z’s instead of huddling under a parka trying to remember why you thought it was fun to dive in January. Another thing I love about summer is that as the ocean warms, we start to get some seasonal visitors to our local waters that you can really sink your teeth into. One of my favorites is yellowfin tuna. These fast-swimmers show up in the late summer to our southern coast line from Mexico and supply local seafood mongers with some of the best fish you’ll ever eat. When it’s fresh, the crimson-red steaks with their firm texture and great taste are unbeatable. No wonder some people will say grilling tuna is the best way to enjoy but I don’t believe that there is any better way to enjoy then as the good lord intended. It’s time to go raw. Now for those of you that make sushi at home, you realize it’s kind of hassle. There are a lot of moving parts and other prep work plus the physical act of molding rice, fish, and seaweed together so it doesn’t look like something my 16-month old daughter might have made in our yard. No, I’m thinking something much simpler and for that we look to out 50th state, Hawaii, and the delicacy they call Poke. 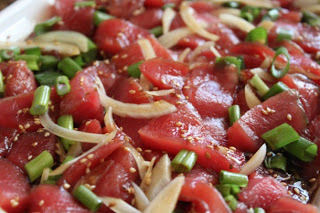 Now Poke is a pretty simple dish that you actually can find in a lot of different cultures in the south Pacific that are only differentiated by subtle variations in the basic recipe. Its literal translation is the verb “cut” which besides a little mixing, is all your going to have to do to make this dish. I’m offering a California variation minus the limu(seaweed) and substituting avocado for logistical reasons as much as taste. That being said, I encourage you to do it however you want. The only thing I promise is that if you have good fresh ingredients then you will find yourself enjoying a delicious taste of summer. Combine the last 5 ingredients in a bowl and let sit for 15 minutes. Add to the first 4 ingredients and gently mix so you don’t break up the tuna chunks and chill. Serve it with tortilla chips, just eat by itself, or serve it on a bed of lettuce as a salad. And as for making best choices when purchasing, Seafood Watch recommends both pole-and line or troll caught so ask the guys behind the fish counter.